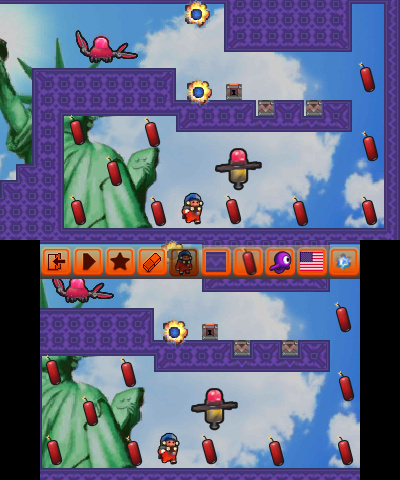 Imagine a 2D game with a simple premise: collect all pieces of dynamite in each stage without taking any damage. Instead of running and jumping around like you would in a traditional platformer, you thrust freely throughout the bite-sized stages with a trusty jetpack. 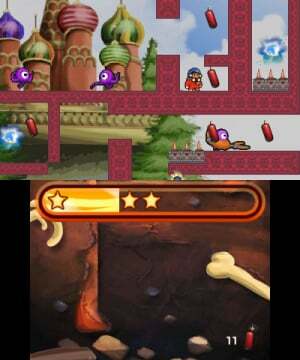 With unlimited use of this ability, along with an endless supply of dynamite to throw at creatures inhabiting the surroundings, the focus is on careful and quick navigation instead of managing resources or obtaining power-ups; avoiding enemies, spikes, and lasers by flipping switches and using teleports is also a big part of the routine. Then, depending on how quickly all dynamite is collected, you'll earn a rating between 1-3 stars for your efforts. Sounds pretty good, right? That's the description of Johnny Dynamite, a new 3DS eShop game that's, sadly, not quite as explosive as its title suggests. So, getting right to brass tacks, Johnny Dynamite is adequately entertaining, but it doesn't do anything to be particularly memorable. Applying thrusters to fly around the fairly basic levels is easy-to-grasp and responsive, and chucking explosives is reliable, if a little slow. But it's the mediocre stage design that keeps the mechanics from carrying much worth. Don't expect adventure-driven levels with secrets and intricacies; this is an arcade-style layout where platforms and beams are presented inorganically for the primary goal of serving as obstacles. This, of course, isn't necessarily an issue; our criticism derives from the fact that we took advantage of the level editor and were able to effortlessly whip up a couple of quick creations that we believe match the quality of what's been prepared by the developer. It's not like we needed a level editor to allow us to see how unambitious the game's levels are, but it did serve as assurance that our impressions weren't out of line. And it's not just about underwhelming levels; there are some other flaws to address as well. Of the 54 levels available, there are more than a few that feature areas with claustrophobic pathways, which can lead to clumsy navigation. This isn't typically much of hindrance on its own; it's when an enemy or hazard is worked into the mix that things can become problematic. Furthermore, the hit detection is somewhat unforgiving, as we experienced more than a few deaths that left us scratching our head. But, thankfully, because the levels are very brief and restarts are quick, you won't spend much time dwelling on any of these unfortunate moments. According to the 3DS Activity Log, we blew through all of the levels on offer within an hour, gaining 2-3 star ratings as we went. 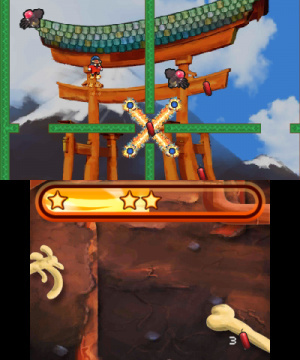 Going for 3 stars on every level will likely double that playtime because you'll need to learn to manoeuvre through tricky obstacle courses without missing a beat or grazing a hazard. It's a challenge to be sure, though anyone that sticks with it should be able to achieve highest honours in due time. The biggest hurdle is actually figuring out which pathway or sequence is the fastest, and then practicing it a few times. Just be prepared for more tension and painful deaths if this is something you're setting out to do. In regards to the level editor, which we briefly touched upon above, it's surprisingly accessible and intuitive. Using the touchscreen to select assets and distribute them throughout the grid is as easy as a couple of taps and a bit of dragging. The constrained view that only allows you to see about ¼ of the available space at a time can be a real annoyance however, since you can never get an overall view of the entire layout – but we got used to it in time. 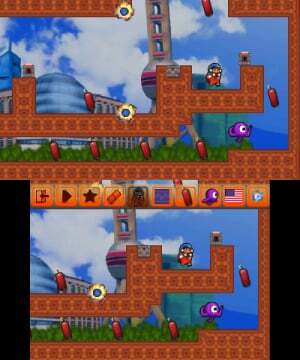 What really hurts the potential of the level editor is the fact that there's no in-game online distribution option to allow you to share or download stages that you and other people have created; you'll instead need to create a QR code and deliver it manually through your own channels – e.g. uploading the QR code to social media or snapping a screenshot with a cell phone and texting it to a friend. The lack of this feature isn't all that surprising given the budget price and production, but it will surely disappoint those that aim to stretch their dollar as far as they can. Additionally, there's a limit to how many assets you can place, which ensures you won't be coming up with extremely dense designs. When it comes to the stereoscopic 3D and the general presentation, there are two layers of depth, with the action unfolding above flat, JPEG-like images that reside in the background. These graphics are unflattering, and they're a constant reminder that Johnny Dynamite might be functional and occasionally fun, but it's not trying all that hard to be special. That's probably the ideal way to summarize the game. 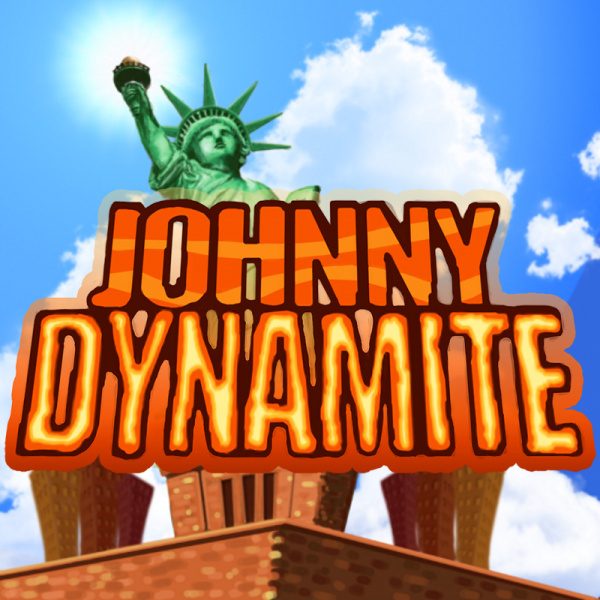 If you want a distraction during a short summer road trip or merely want a bite-sized challenge to tide you over a few days before a big release, Johnny Dynamite might be what you're looking for. Otherwise, you won't be missing much if you pass. Even though Johnny Dynamite is loaded with 54 levels and a level editor, it doesn't pack a big enough explosion to grab your attention for long. The presentation is a touch cheap, the level design is unimpressive, and the game is generally forgettable. However, because the mechanics are sound and easy to grasp, and because this is a one-more-go kind of experience, a playthrough can be somewhat enjoyable while it lasts. So… is this a Mighty Bomb Jack clone? @ChessboardMan Exactly what I was thinking. Was kinda disappointed to not see it mentioned in the review. Does this mean that it doesn't really play like Bomb Jack? Or does the review simply not know about Bomb Jack? If it is anything like Mighty Bomb Jack I would pick it up. @ChessboardMan @Pablo17 Is it a Mighty Bomb Jack clone? Not really, it's more of a homage to it if anything In JD you can choose to fight back against the enemies or dodge if you prefer, but you'll need to dispatch the enemies on certain levels to complete within the 3 star time limit. Plus there's the editor to make your own stages. It is alright, but the way they do sharing of levels is just wrong. Enjoy Gaming should have taken a page from Little Big Planet on that. Now that is how you do sharing levels right. Also the so-called "Story Mode" is misleading.